The Past Ain't What it Used to Be! - How Rob Minkoff and his team at DreamWorks assembled a shiny, new version of Jay Ward's classic cartoon Mr. Peabody & Sherman. Minifigs Meet the Big Screen - Phil Lord and Chris miller team up with Aussie studio Animal Logic to construct WB's The LEGO Movie. Meet the Shiny Future of Law Enforcement - VFX supervisor Jamie Price and production designer Martin Whist reveal some of the details behind Sony's RoboCop. In Pursuit of Art and Quality Content This year's Cartoon Movie in France will highlight bold, new features which aren't afraid to tackle tough, non-commercial subjects. 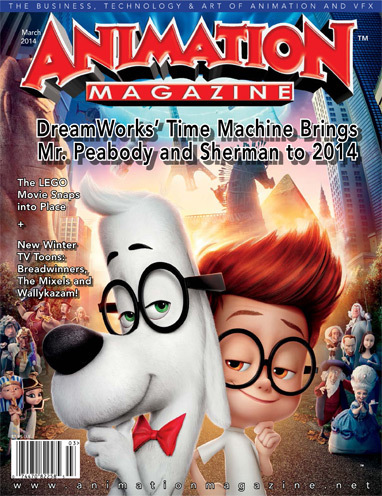 Mr. Peabody & Sherman, The LEGO Movie, I Lost My Body, Wallykazam!, Possessions, RoboCop, Cartoon Movie and much more!